Every year, the garbage problem in Metro Manila is becoming worse with the increasing volume of trash people produce and landfills that are already reaching their capacity. According to the Metro Manila Development Authority (MMDA) report, the trash produced in the National Capital Region has reached 56,000 cubic meters in 2018, an increase from the 54,000 cubic meters of trash produced in 2017. MMDA report also said that 44 percent of the volume of garbage produced in NCR is biodegradable, while 32 percent is non-biodegradable. And it takes trucks about 1,200 to 1,500 trips to transport NCR’s trash to sanitary fills. One company offers a solution to significantly reduce that huge volume of trash. 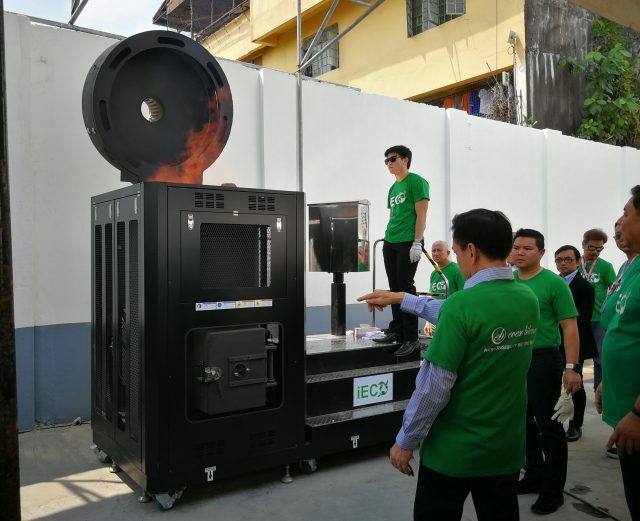 One Earth Enviro-Care, Inc., a sister company of cosmetics manufacturer Ever Bilena, recently introduced an eco-friendly and portable incinerator called the iECO-800 intended for use for small scale incineration of residual waste. According to Eva Adoremos, an official at One Earth, the eco-friendly burner is the only available mobile thermal technology that can process trash on site. As such, it can be easily placed in every baranggay so each baranggay or a cluster of baranggays can already manage and dispose their trash in an environmentally-friendly manner. “With this iECO product, we can empower every baranggay to help decentralize waste collection in the city. The waste that they collected from their municipality or baranggay doesn’t need to be brought to the landfills because they can process it right in their own place,” said Adoremos. Adoremos emphasized on the green features of the iECO and the huge savings local government units would enjoy by deploying the mobile trash burner in the baranggays. “Incinerators” have been perceived as bad to the environment, but it’s actually just a perception, according to Adoremos. She said current incinerators already feature green design and technologies and a number of developed countries are already using them to process their garbage because they’re very efficient and cost-effective than maintaining landfills. The iECO can process all types of waste—hazardous waste, medical wast, industrial waste, even wet garbage and sludge. It can process 3,000 kilos of garbage per day. The iECO 800 is also ideal for use by manufacturing industries, big commercial establishments, hospitals. It is plug and play and as a green product, it consumes little electricity for the blower function and used cook oil to fire up the burner. As to its portability, it can be placed on a trailer or a flatbed truck and easily transported to areas where it is needed. Adoremos said the iECO would also be useful in situations like in the recent trash cleanup done by the MMDA at the Roxas Boulevard, where big pile of trash from the sea flowed to the highway because of storm surge. “For example, the garbage collected at Roxas Boulevard in the aftermath of the storm. The machine can process the garbage right there in the area without the need of dump trucks and transporting it to faraway landfill. In the recent cleanup, it took about 50 truckloads and manpower to do the job. With this, you don’t need trucks to bring it to the landfill. All you have to do is bring the machine to the site and process the garbage there,” Adoremos said. The cost of getting the iECO compared to truck garbage collection that goes to landfill is definitely lower, said Adoremos. “The iECO-800 is an eco-friendly burner for small scale incineration of residual waste with no smoke and no smell and very low operating cost. It unburdens landfills and also reduces the environmental and health risks of transporting garbage,” added Adoremos. The iECO-800 is being piloted at the Ever Bilena manufacturing plant in Caloocan. For inquiries regarding the eco-friendly burner, you may contact One Earth Enviro-Care, Inc. at +63-99993427268, 09175979840 (Eva Adoremos), 09175399833 (Jacob Munez).